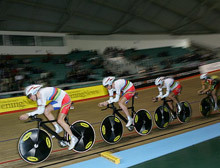 One event where Great Britain normally win many Gold medals at World Cup level is in the Team Pursuit. We had two teams entered - Great Britain made up of the Olympic Academy riders and the Recycling.co.uk riders which had three of the World Championship winning team from Los Angeles. The Academy riders pictured right, went out onto the track early and everything went to schedule, with the boys doing a '13' which at the end of the day, was only a couple of seconds off the pace of the best in qualifying who did '9's. Talking to Ed Clancy who rode for Great Britain with Andy Tennant, Ross Sander and Geraint Thomas, he says of the ride "We all said we were pretty comfy in the first 2k and it all went to plan. Andy's job was to do a do or die last turn and get out which he did and then I was to do a lap and a half and then hang on after that. We were pretty much on schedule the whole way - it was a little rocky and up and down, but that was expected when riders like me come in to an established team line-up." "We're all pretty pleased and all got everything out. Given the conditions, a 13 isn't bad. We're all fit but we haven't done any race efforts so we didn't have any race fitness as it were, and out of our team, all four of us have been ill in the last two or three weeks. So we're all pleased and happy with the ride." The academy coach Rod Ellingworth says of the ride "It was what we expected of them and its good they are within a few seconds of our top boys. We scored points which is good for GB as well. There is so much more to come - we know that. If we can get a ride in Sydney, then we'll be able to get out there and improve on that. There was nothing in that ride that surprised us." 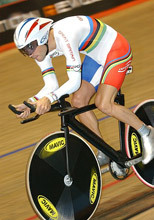 What did surprise many was the performance of our three World Champions and Mark Cavendish. 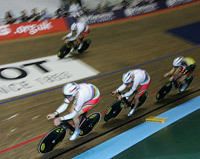 They did a '9' in qualifying and as teams came and went and failed to beat their time which was in second place after their ride, the riders in the team were starting to see a chance at a medal ride after at one point thinking they may not even get a ride at a medal after qualifying. They did and the final was a real humdinger with the gap between the Brits and the New Zealanders never very much but the Kiwi's held on and beat the World Champions which they celebrated long and hard. A silver medal for the Recycling boys was actually more than they expected after the qualifying ride, a ride that almost never took place after illness in the team in recent weeks. Speaking to Rob Hayles afterwards, he said of the race - "it was a good race. I had a quick peak across and knew it was tight. That was a proper fight that one - out of the comfort zone for sure." "Five days ago, we weren't sure we going to take the start with Paul being ill, myself and Cav were ill after the Gent six day, and it was only Tuesday of this week when I was flat out in a warm-up. So considering the preparation, it was fair result. I know over the last few years we have won here with little Team Pursuit preparation and for this one, we did little preparation of any kind. Myself and Cav had been away at the sixes." "I'm really pleased all considered and it was nice to get up there in the jersey's. We expected to get a second ride but it was nice to get a ride off for Gold. We were lucky that the other teams fell apart - the Spanish, the Ukraines, so we were fortunate in that respect. It was amazing to have all these countries doing whatever they are doing and come here and you're all within a few tenths. It always amazes me that." Finally, I couldn't help but comment on the crowd, who made one hell of a racket getting behind our boys and it certainly pleased Rob. "It was noisy alright but it was good!"